When will the Target Prepaid REDcard be discontinued? What happens if I still have a balance on my Card after August 13, 2018? Will I be able to login into my Prepaid REDcard Account after the Account is closed? What happens to my Reserve? What happens to my Subaccount(s)? When can I expect to get my refund check? What happens if I do not receive my refund check? What will happen if I have not registered my Prepaid REDcard Temporary Card? How do I make in-store purchases? How do I make online, mail-order, or phone purchases? What are Target's plans for chip cards? How will this change the way I pay at Target? Will I need to do anything different when I get my new Target chip card? Which ATMs can I withdraw money from? Where can I find an Allpoint ATM? How do I use the Pay Bills feature? How do I use the Mail a Check feature? How can I check the status of my bill payment? How long does it take for my payee to receive payment? Can I schedule bill pay reminders? Who can use the Pay Bills and Mail a Check feature? How do I send to or request money from someone? How do I view my transaction history and Account balance? How do I view my previous Account statements? What can or can't Subaccount Users do? How do I create a Subaccount? Who can I create a Subaccount for? Can I create more than one Subaccount? How do I cancel a Subaccount? How do I change my Prepaid REDcard Account profile information such as address, phone number, user ID, password, etc.? How do I opt out from receiving marketing emails from Prepaid REDcard? How do I dispute a transaction on my Account? How long will it take to resolve? What if I have a problem with a transaction that does not constitute an error? What should I do if my Card is lost, stolen, or damaged? How do I close (cancel) my Account? Are there fees to add money to Prepaid REDcard? What are the transaction limits on my Prepaid REDcard? How do I create a Reserve? How do I add money to Reserve? How do I spend money in Reserve? Can I edit my scheduled recurring transfer? How does the pause functionality work? What is Roadside Assistance Hotline? What is Global Assist® Hotline? How does the 5% REDcard® discount program work? How do I enroll in the 5% REDcard® discount program? How do I enroll in the Take Charge of Education program? What is the REDcard Free Ship Benefit? What is the REDcard 30-Day Extended Return Benefit? Only the Target Prepaid REDcard from American Express is being discontinued. If you would like to continue saving 5% off* your Target and Target.com purchases, you can apply for a credit or debit REDcard in-store or at Target.com/REDcard. 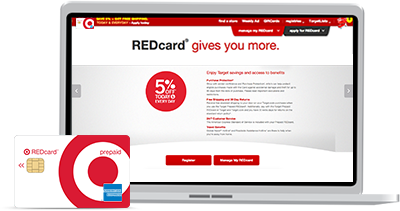 * 5% REDcardTM Discount: You will receive 5% off purchases paid for with your REDcard at Target stores and Target.com, except on prescriptions, some pharmacy purchases, Target gift cards and prepaid cards, clinic services at Target, Target OpticalTM eye exams, some independent businesses in Target stores, wireless protection programs and mobile carrier deposits. 5% discount applies to eligible purchases minus any other discounts and the value of any promotional Target gift cards received in the transactions. Restrictions apply to all REDcard benefits. See program rules in-store or Target.com/REDcard for details. We are discontinuing the Target Prepaid REDcard on August 13, 2018, and you will no longer be able to use the Card as of that date. We apologize for any inconvenience this may cause and we hope to have the opportunity to serve you again in the future. After July 13, 2018 you will no longer be able to reload your Card. Before August 13, 2018 you should spend down the available balance on your Account at Target or virtually anywhere American Express® Cards are accepted. You can withdraw funds for free at ATMs at Target stores (except in Kansas City, MO) and over 40,000 All Point Network ATMs. You can find ATM locations at allpointnetwork.com. As of August 13, 2018 you will no longer be able to receive direct deposit to your Account. As soon as possible, before August 13, 2018, please redirect any direct deposit payments (such as a regular paycheck) to your Account to avoid disruption of service. What happens if I still have a balance on my Card on August 13, 2018? After your Account is closed, if you have any remaining balance on your Card after August 13, 2018, we will mail you a check to the address we have on file for you. If your address is not current in your Account profile, please log in to https://secure.prepaidredcard.com/manage to update it, so that you receive your refund check. If you are a temporary Target Prepaid REDcard, you can continue to spend down your balance. Will I be able to login into my Prepaid REDcard Account after August 13, 2018? You will still be able to login into your Account and access monthly statements for 90 days after your Account is closed. Your Reserve will also be closed with your Target Prepaid REDcard Account. We encourage you to transfer your remaining Reserve balance to your Account and then spend down the available balance before August 13, 2018. After your Account is closed, any funds left remaining in Reserve will be added to your Account balance and included in the refund check mailed to the address we have on file for you. Your Subaccount(s), will also be closed with your Target Prepaid REDcard Account. We encourage you to spend down the available balance in your Subaccount(s) before August 13, 2018. After your Account is closed, any funds left remaining in your Subaccount(s) will be added to your Account balance and included in the refund check mailed to the address we have on file for you. The quickest way to access to your remaining funds is to spend down your available account balance or withdraw your funds for free at ATMs at Target stores (except in Kansas City, MO) and over 40,000 All Point Network ATMs before August 13, 2018. Your Account will be closed on August 13, 2018, and if you have any remaining balance on your Card at that time, we will mail you a check to the address we have on file for you via standard U.S. mail. If your address is not current in your Account profile, please update it at https://secure.prepaidredcard.com/manage so you receive your check. Please allow at least 10 business days for delivery. If you do not receive your refund check, please call 1-855-306-7395 to ensure we have the correct address and we will send you another check. You can continue to use your Temporary Card after August 13, 2018, until your balance is $0.00 or your card plastic expires. The funds on your Temporary Card do not expire. You can use your Card at US Target stores and virtually anywhere American Express® Cards are accepted. If a merchant asks you to choose between “credit” and “debit,” select “credit.” No PIN is required for in-store purchases. You can use your Card for online, mail-order, or phone purchases with merchants that accept American Express Cards. Be sure to have your 15-digit Card number, the “valid thru” date, and the 4-digit security code on the front of the Card. *Card not usable at ATMs in Target stores in Kansas City, MO. Allpoint ATM locations can be found at www.allpointnetwork.com Your Card is not usable at ATMs in Target stores in Kansas City, MO. Log in to your Prepaid REDcard Account. Click Pay &Transfer and then choose Pay Bills from the drop down menu. You can search by the business name or by Top Payees in your local area. To search by the business name, simply click on Add Payee, enter the business you want to pay and click search. To search by top payees in your local area, scroll down the page to the section Top Payees in Your Area. Select the business you want to pay or click on the category name to display more of the top businesses in that category. Then click on the name of the business you want to pay, fill out the form and click Submit. If the business does not appear in the search results for that category, enter the name of the business in the search for a payee box. Log in to your Account. Click Pay & Transfer at the top of the main page and select Pay Bills from the drop down menu. Simply scroll down to find the payee and click Pay. Fill out the form and click Submit. To add a new payee, please return to the Pay Bills page and click Add Payee located at the top right corner of the page. Click Pay &Transfer and then choose "Mail a Check" from the drop down menu. Click on "Select a Payee" drop down, if this is a new payee select "Add a Payee". If you have mailed a check to this payee before it will appear in the drop down list for you to select from. From here fill in the check amount. Add an optional memo describing what the payment is for. Then select "Continue". If you selected "Add a Payee" you will see the screen where you will enter the Payee Name, Nickname (optional), Payee Address, and Payee Phone #. Once the information has been filled in, select "Save and Pay". You will then see a screen that shows detailed information about the check, and a prompt to enter your ATM PIN. You can also edit the payee address if needed. Then, to mail the check, simply enter your four digit PIN and select "Submit". You will then see the confirmation screen. If you would like to see your mail a check transaction information you can click "View Past Transactions" on any of the Write a Check screens or click "View Transactions" on the main account page. After you’ve submitted your payment, you can check the status of your bill payment any time through the Transaction Details page. Just log into your Account, click on View Transactions, and select the bill payment transaction to view the status of your payment. Timing depends on the type of payee. If you pay a payee from our list of pre-registered businesses ("registered payee"), it will take two business days. If the payee is not a "registered payee", where we mail them a check for you, it will normally take about five business days. Prepaid REDcard offers a Pay Bills Guarantee as long as the payment is requested at least 6 business days prior to the bill's due date. We will bear responsibility for late payment-related charges (up to a maximum of $50 per transaction) should a Pay Bills bill payment arrive after its due date. Additional terms apply; please see your applicable Consumer User Agreement for details. Yes, you can set up a bill pay reminder for each of your payees. Click Pay & Transfer and then choose Pay Bills from the drop down menu, then scroll down and click Pay a Bill. If the bill pay is for an existing Payee, click Payee Settings , then Set Reminder under the Bill Reminder section. Then, select your reminder date and reminder frequency and click “Save”. In order to be protected by our Bill Pay Guarantee, you must pay your bill at least 6 business days before your bill is due. Pay Bills and Mail a Check features are available to all Serve Accountholders except for Sub Accounts. In order to use these features, the Accountholder must have activated their Card and be in good standing. You can send money to or request money from anyone with a Target Prepaid REDcard Account or American Express Serve Account. If you send money to or request money from someone who does not yet have an Account, then that person will receive email instructions on how to register for an Account. Once they successfully register for their Account, they can begin to send and receive money. To send or request money, please log in to your Target Prepaid REDcard Account. Click Pay & Transfer, then choose Send Money or Request Money from the drop down menu. From there, just follow the directions provided. We will notify you via email when your send or request has been accepted, cancelled or negotiated. Chip cards are cards that are embedded with small electronic chips. Chip cards represent some of the best security available for payments cards. They have features to help protect you against fraud, and they're difficult to counterfeit. When you use one of these cards, a card reader can interact with the chip instead of reading information off a magnetic stripe, and that helps keep your information secure. You might also hear people talk about "EMV" cards. EMV is an international standard that both card issuers and retailers use to make chip cards work. Two big changes are coming. All Target stores are being set up to accept chip cards at checkout, and all Target REDcards are being replaced with chip cards. Target is an industry leader in bringing this technology to the U.S. and offering another way to secure pay. Once Target stores are setup and ready, you'll be able to pay using your chip card. Don't have a chip card? Don't worry. Target stores will still be able to read the magnetic stripe on your card. When you use your new Prepaid REDcard at a Target store, the chip will be used to read your Card instead of a magnetic stripe. You'll also need to use a PIN for every transaction in Target stores instead of signing. The chip in your REDcard validates your Card is authentic, and the PIN helps to validate you as the Card user at chip-enabled terminals. You will receive information about how to set up your PIN when the Card arrives. To view your balance or transaction history, log in to your Prepaid REDcard Account. You can view your recent transaction history and Account balance on your homepage after you’ve logged in. Select View Transactions at the top of the main page to view your detailed transaction history. First, log in to your Prepaid REDcard Account. Click Settings at the top right hand corner of the main page and then select statements. You will find each monthly statement for the last 24 months. For statements prior to the most recent 24 months, please contact customer service at 855-306-7395 or international collect: 602-734-2449. A Subaccount is an Account that you establish under your Prepaid REDcard Account for another person age 13 or older. This Account is linked to, funded, and controlled by the Main Prepaid REDcard Account holder. Subaccounts are a convenient and flexible way that you can give family and friends access to money, while seeing transaction activity and setting limits. Seamlessly pay your child's allowance, send money to your children at college, make funds available to the handyman for home repairs, etc. Use their Cards at US Target stores and virtually any merchant that accepts American Express® Cards in the U.S.
Use their Personalized Card for FREE ATM usage at US Target stores* and over 43,000 US Allpoint network ATMs (ATM usage not available at any other ATMs) Find an Allpoint ATM at: www.allpointnetwork.com * Card not usable at ATMs in Target stores in Kansas City, MO. Send money to and request money from a Main Account holder. Add money to their Account. Use the Prepaid REDcard Bill Pay feature. Send money to or receive money from other Subaccounts. Click on Plan & Manage at the top of the main page and then select Subaccounts from the drop down menu. Scroll down and click Create a Subaccount. Please provide the required information. You will need the name and email address of the Subaccount user to create the Account. If you have created a Subaccount before then simply follow the first 2 steps stated above. Once you are on the Subaccounts page, click Add Subaccount, fill out the form and select Create. You can create a Subaccount for anyone age 13 or older that you give money to on a regular basis. You can create a Subaccount for your child, babysitter, handyman, or for anybody you choose. Yes. You can create up to four Subaccounts on your Prepaid REDcard Account. First, log in to your Prepaid REDcard Account. Click Plan & Manage at the top of the main page and then select Subaccounts from the drop down menu. Select Settings under each Subaccount and click Close Subaccount. To update any of your profile information including your address, email address, phone number, password, PIN and security answer, log in to your Prepaid REDcard Account and select Profile at the top right hand corner of the main page. How do I opt out from receiving marketing emails from Target Prepaid REDcard? Log in to your Prepaid REDcard Account and click Profile at the top right hand corner of the main page. Select Privacy Preferences under Communication Preferences. There, you can simply uncheck the box to unsubscribe from all marketing emails. Please remember to click Save Changes before you leave the page. You can also click on the unsubscribe link at the bottom of your email offer. Your changes will not impact any account-related servicing communications. Your name and Prepaid REDcard Account number. Description of the transfer or transaction you are unsure about, and explanation of why you believe it is in error or why you need more information. The dollar amount and, to the extent possible, date, of the suspected error. If you choose to call Customer Service and tell us of the Dispute orally, we may require that you send us your Dispute in writing within 10 business days. If we receive a Dispute (including the required information referenced above) within 60 days after we sent the first statement on which the Disputed transfer or transaction appears (or within 60 days after we send you the information you requested), we will investigate and determine whether an error occurred within 10 business days after we receive the Dispute, and will correct any errors within (1) business day of our determination that an error occurred. If we need more time, however, we may take up to 45 days to investigate your Dispute. If we decide more time is needed, we will provisionally credit your Account within 10 business days of our receipt of your Dispute for the amount you believe is an error, so that you will have use of this money during the time it takes to complete our investigation. If we ask you to send us your Dispute in writing, and we do not receive it within 10 business days, we may not provisionally credit your Account. For errors involving new Accounts, point-of-sale, or foreign-initiated transactions, we may take up to 90 days to investigate your complaint or question. For new Accounts, we may take up to 20 business days to provisionally credit your Account for the amount you believe is an error. We will notify you of the results of our investigation within 3 business days after its completion and will correct any error within (1) business day of our determination that an error occurred. If we decide there was no error, we will send you a written explanation and will debit any related provisionally-credited amounts in accordance with applicable law. You may ask for copies of documents that we used in our investigation. All other types of Disputes (e.g. goods not delivered, or goods or services not as promised or damaged) are not considered errors. Under the terms of our Agreement, you are required to work directly with the merchant to resolve such claims and we are not responsible for and do not have any liability for any goods or services purchased where the problem does not constitute an error. However, if you have been unable to resolve the issue with the merchant, we will provide a limited service whereby we will attempt to work with the merchant on your behalf in an effort to resolve the problem. We will advise you of the results of our effort; however, we will not provisionally credit your Account during the time we are working with the merchant. If it is determined that a correction is due to your Account, we will Process a correction to your Account. Call us immediately at 855-306-7395 or international collect at 602-734-2449. We will cancel your existing Card and issue you a replacement Card at no charge with a value equal to the Available Balance on your Card at the time you notified us. If you have not yet registered for an Account or verified your email address, no refunds will be provided for amounts debited from your lost or stolen Card before you have notified us. Once you have registered for an Account and verified your email address, you will not be held responsible for any fraudulent charges made using the Card. If you have a funding source linked to your Account, you should immediately contact your bank or employer directly and open a dispute claim on any unauthorized withdrawals. You can close your Account, which will cancel your Card, online by logging into your Account and following the directions below. Please note in order to close your account your balance, and all subaccount balances must be $0. Also, all associated Subaccounts will be closed when you close your Account. The fastest way to withdraw the balance of your Account is by ATM. We offer Free ATM usage at US Target stores* and over 43,000 US Allpoint network ATMs (ATM usage not available at any other ATMs). Once logged in, go to "Settings"
Then scroll down and click on "Close Account"
If you need additional support, please call Customer Service at 1-855-306-7395. Below is some helpful information that will help you understand our fees. 2Card not usable at ATMs in Target stores in Kansas, MO. 3Add money from a linked U.S. issued checking or savings Account. Note: As of October 28, 2015 you will not be able to link a new bank account to your Prepaid REDcard Account to add money. After October 28, depending on your bank's policies and terms, you may be able to add money to your Prepaid REDcard Account from your checking or savings account by initiating a transfer from your bank account into your Prepaid REDcard Account. Consult with your bank for bank origination fees that may apply. Once you have verified your email and activated your Card, the following limits apply to your Account, which includes any Reserve and Subaccounts you may have. Please note that, subject to applicable law, we reserve the right to set additional limits to individual Accounts or to modify limits at our discretion. When you add money to your Personalized Card, we will place the funds into custodial accounts we maintain for the benefit of Prepaid REDcard Members at one or more FDIC-insured banks (currently Wells Fargo Bank, N.A. and American Express National Bank). If one of the banks in which we have placed your funds fails, your funds should be insured by the FDIC up to the maximum per-depositor coverage limit (currently $250,000 in most instances). Funds on the Temporary Card are not insured by the FDIC. American Express Travel Related Services Company, Inc. is not a bank, and FDIC insurance does not protect you against the risk of our insolvency. Also, when you add money to your Personalized Account, it will take us approximately one business day to place your funds into a custodial account. Your funds will not be insured by the FDIC until we deposit them into the account we maintain at the FDIC-insured bank. More information about FDIC insurance coverage for Account funds is available below. 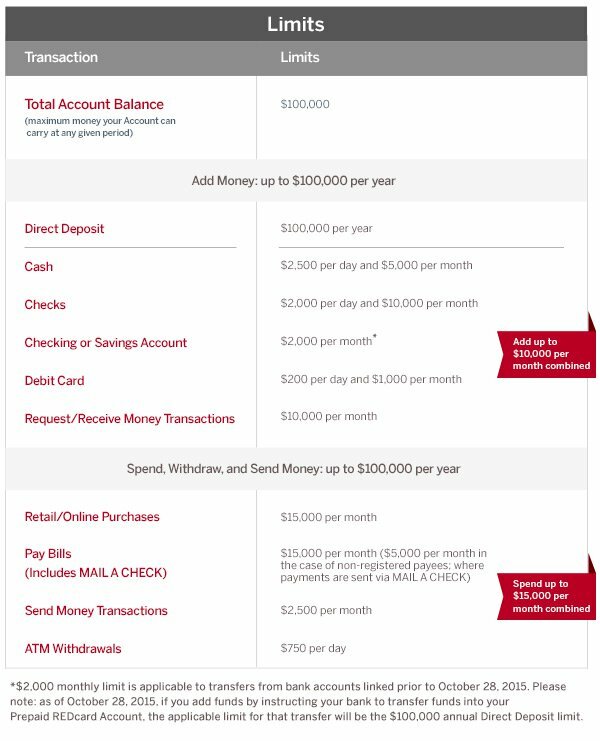 When you add money to your Prepaid REDcard Account, the funds will be placed by us into one or more custodial accounts (“Custodial Account(s)”) we maintain for the benefit of Prepaid REDcard Account holders at one or more FDIC-insured banks (currently Wells Fargo Bank, N.A. and American Express National Bank). These Custodial Accounts will be set up to provide pass-through FDIC insurance. Subject to the limitations set forth below, this means that if a bank holding a Custodial Account fails, you should be insured by the FDIC up to the per-depositor coverage limit then in place (currently $250,000 in most instances). Note that the FDIC insurance maximum applies to all of the funds that you have on deposit with the bank that fails, including funds that you have in deposit accounts with the bank other than your Prepaid REDcard Account-related funds in the Custodial Account. Your Prepaid REDcard Account funds will not receive the benefit of FDIC insurance before they are placed in one of the Custodial Accounts referenced above. We will place funds into the Custodial Accounts not later than the business day after those funds are credited to your Prepaid REDcard Account. FDIC insurance coverage is contingent upon our maintaining accurate records and on determinations of the FDIC as receiver at the time of a receivership of a bank holding a Custodial Account. FDIC pass-through insurance protects funds placed on behalf of a Prepaid REDcard Account holder against the risk of loss (up to the then applicable FDIC deposit insurance limits) should any FDIC-insured bank(s) where we maintain Custodial Account(s) fail. FDIC pass-through insurance does not protect you against the risk of our insolvency. In the unlikely event of our insolvency, funds we place in a Custodial Account should be protected from claims by our creditors; however, it is possible that funds that we hold before placement in a Custodial Account will not be protected from claims by our creditors. Even if funds in your Prepaid REDcard Account (whether held by us or held in a Custodial Account) are protected from claims by our creditors, in the unlikely event of our insolvency, it is possible that you will not have access to those funds while court or other legal proceedings are ongoing. FDIC pass-through insurance also does not protect you against the risk that an attempted funding of your Prepaid REDcard Account might fail to complete or be reversed (for example, if a check that you deliver to us is dishonored or a related credit is reversed after initial honor). Funds on Temporary Cards are not eligible for FDIC pass-through insurance. When you complete registration online and establish a Prepaid REDcard Account, your Temporary Card funds will be transferred to your Prepaid REDcard Account and be eligible for FDIC pass-through insurance within one business day of establishment of your Prepaid REDcard Account. Reserve is an easy way to set aside money for a large purchase or vacation. Move money into your Reserve as often as you wish, and when you’re ready to spend it, just transfer it back into your Prepaid REDcard Account. It’s easy to create a Reserve. Log in to your Prepaid REDcard Account. Click Plan & Manage and then select Reserve from the drop down menu. Click on Create a Reserve. Enter a name for your Reserve (e.g. “My vacation”). Enter the amount you want to transfer from your Available Balance in your Main Account. Select a one-time transfer or schedule a recurring transfer. If you select a recurring transfer, please take note of the amount and date of the recurring transfer and ensure that you have enough money in your Main Account Available Balance to cover the transfer when it occurs. There are no fees for a declined transaction, but if there is not enough money in your Account, the transfer will not be processed. Funds can only be added to your Reserve by transferring money from your Available Balance in your Main Account. Funds will be available in your Reserve almost instantly. There is no limit on the number of times you can transfer funds from the Prepaid REDcard Main Account into your Reserve. To spend the money in your Reserve, transfer money from your Reserve back to your Prepaid REDcard Main Account. The funds will be available almost instantly to make purchases, pay rent or for a rainy day. There is no limit on the number of times you can transfer funds from your Reserve to your Main Account. Yes. You can edit the amount and the frequency of an existing recurring transfer. Log in to your Prepaid REDcard Account, click on Plan & Manage then Select Reserve from the drop down menu. Click Edit Settings and edit the appropriate information. Before submitting, please take note of the new amount and start date of the recurring transfer. You may also use this functionality to pause or delete your scheduled recurring transfers. Pausing a scheduled recurring transfer temporarily stops your transfers. To continue your scheduled recurring transfer, click Resume. 1 Roadside Assistance Hotline is a 24-hour dispatch hotline that can send a tow operator or locksmith to assist in an emergency situation. While Roadside Assistance Hotline is available at no additional charge, the Card Member will be charged for any services or goods provided. Tow operator or locksmith can provide the following services: towing, winching, jump starts, flat tire change when Card Member has a workable spare, lockout service when key is in vehicle and delivery of up to 2 gallons of fuel. Services are available when traveling within the 50 United States, the District of Columbia, Canada, Puerto Rico and the U.S. Virgin Islands and only when Card Member is present with the eligible vehicle. This product does not cover some vehicles, e.g. rental vehicles, motorcycles, taxicabs, unlicensed vehicles, tractors and trucks over 10,000 lbs gross vehicle weight. Other important exclusions apply. We may be unable to provide you with coordination and assistance services in case of inclement weather or on roadways which restrict access to certain service providers. Lockout service may be unavailable for vehicles with transponder keys. Subject to additional important terms, conditions and exclusions. For full Terms and Conditions, call 855-431-1156 or see Prepaid REDcard User Agreement. Shop with added confidence and Purchase Protection◆, which can help protect eligible purchases made with the Card against accidental damage and theft for up to 120 days* from the date of purchase. Please read important exclusions and restrictions. ◆ Purchase Protection is underwritten by AMEX Assurance Company, Administrative Office, Phoenix, AZ under Policy AX0951, Policy AX0951-PR, Policy AX0951-VI, or Policy PP-IND. Coverage is determined by the terms, conditions, and exclusions of the Policies applicable to your Card and is subject to change with notice. This document does not supplement or replace the Policy. Shipping and handling costs for the purchase will not be refunded. Certain purchases are not covered, e.g. items lost by Card Member, consumable and perishable items, motorized vehicles and their parts or accessories, or normal wear and tear. Other important exclusions apply. You will only be reimbursed for the amount charged to your eligible Card; coverage is limited up to $1,000 per occurrence; not to exceed $50,000 per Card Member account per calendar year. You may be required to send the purchased item to us, in which case we will reimburse you for that shipping cost. This product provides secondary coverage. This means it pays eligible benefits not paid by any primary insurance that you have. For full Terms and Conditions, see americanexpress.com/PPterms. * For residents of New York, Indiana, Guam, Puerto Rico, and Northern Mariana Islands coverage duration remains at 90 days. 2 While Global Assist® Hotline coordination and assistance services are offered at no additional charge from American Express, Card Members are responsible for the costs charged by third-party service providers. For full Terms and Conditions, see Prepaid REDCard User Agreement. 3 Offer valid in select cities. During the specified sales period, tickets are available exclusively to all American Express® Card Members. Tickets must be purchased with an American Express Card. Standard service charges apply. Offer is subject to availability. Not all seats are available and blackout dates apply. All sales final. No refunds. No exchanges. Offer may be changed or revoked at any time at the sole discretion of American Express. Some events may not be accessible to Card Members with disabilities. You will receive 5% off purchases paid for with your REDcard® at U.S. Target® stores and Target.com, with just a few exceptions (such as prescriptions, Target® gift cards and prepaid cards, Target Clinic® services and Target Optical® eye exams). For a full list of exclusions and other restrictions, see the program rules at Target.com/prepaidredcard. Click here for complete benefit terms, conditions and limitations. How do I enroll in the 5% REDcard discount program? You're automatically enrolled just by having a REDcard. The Take Charge of Education program is not available at this time for the Target Prepaid REDcard. Target will provide you with free shipping available on most items purchased on Target.com when you use your REDcard. Offer applies on standard shipping to all 50 states and the District of Columbia, as well as APO/FPO addresses and Puerto Rico. If you upgrade your shipping method, shipping fees will apply. Handling fees may apply. Select items may have a minimum purchase threshold. Not valid on previous orders. Click here for complete benefit terms, conditions and limitations. When you make purchases with your Target Prepaid REDcard at Target stores in the U.S. or Target.com, you will receive 30 additional days to return the purchases beyond the standard return policy applicable to each of the purchased items. REDcard extended returns do not apply on Target mobile purchases, purchases with a fixed return date, or non-returnable items. For a full list of exclusions and other restrictions, see the program rules at Target.com/prepaidredcard. Target Prepaid REDcard by American Express Accounts available to U.S. residents who are over 18 years old only (or 19 in certain states) and for use virtually anywhere American Express® Cards are accepted worldwide, subject to verification. Fees apply. Other eligibility requirements and restrictions apply. See the Target Prepaid REDcard Consumer User Agreement for details. Target Prepaid REDcard Service and Cards provided and issued by American Express Travel Related Services Company, Inc., 200 Vesey Street, New York, NY 10285, licensed., licensed as a money transmitter by the New York Department of Financial Services and other money transmitter regulators. Click here for information about addressing complaints regarding our money services business, lists of our money services business licenses, and other disclosures. All users of our online services subject to the Privacy Statement and agree to be bound by the Terms of Service. You can set preferences with AdChoices. © 2018 American Express Travel Related Services Company, Inc. All rights reserved. You are now leaving Target Prepaid REDcard website. 1 You cannot overdraft with the Prepaid REDcard, so there are no overdraft fees. 3 Reloads are not currently available at Target stores in AR and NC. 4 Card not usable at ATMs in Target stores in Kansas City, MO. There are no participating stores in Alaska at this time. There are no participating stores in Arkansas at this time. There are no participating stores in California at this time. There are no participating stores in Connecticut at this time. There are no participating stores in Delaware at this time. There are no participating stores in the District of Columbia at this time. There are no participating stores in Florida at this time. There are no participating stores in Georgia at this time. There are no participating stores in Hawaii at this time. There are no participating stores in Idaho at this time. There are no participating stores in Illinois at this time. There are no participating stores in Iowa at this time. There are no participating stores in Kansas at this time. There are no participating stores in Kentucky at this time. There are no participating stores in Maine at this time. There are no participating stores in Minnesota at this time. There are no participating stores in Montana at this time. There are no participating stores in Nebraska at this time. There are no participating stores in Nevada at this time. There are no participating stores in New York at this time. There are no participating stores in North Dakota at this time. There are no participating stores in Oregon at this time. There are no participating stores in Rhode Island at this time. There are no participating stores in South Dakota at this time. There are no participating stores in Texas at this time. There are no participating stores in Utah at this time. There are no participating stores in Vermont at this time. There are no participating stores in Washington at this time. There are no participating stores in West Virginia at this time. There are no participating stores in Wyoming at this time. There are no participating stores in Louisiana at this time. There are no participating stores in Missouri at this time. There are no participating stores in New Hampshire at this time. There are no participating stores in New Jersey at this time.